Cut the Crap and Just Kiss Him!!! What if he doesn’t life me? I’m not making the first move? He won’t actually like me if I am too aggressive, so I will be very subtle? I just can’t tell what he is thinking and I don’t want to ruin what we have. How many of you are wandering through life living out the character in a sitcom? It can be one of the zany slapstick sitcoms of the 70’s or the more wholesome 80’s or 50’s or even the risqué 90’s/00’s but the bottom line is that too many of us are waiting for the show to be cancelled before the boy and girl come together. It is a nice ride, but when the cancellation occurs in life it is just a little too late. I do understand that centuries of tradition and values have embedded this belief system that a girl should never ask out a boy or even dare we say kiss him first. As ladies, you are to sit back and let the man court you. Don’t tell that to Agent Walker on Chuck or Sarah Connor who bore the savior to the world. Last time I checked these beautiful heroines saved the world, looked fantastic and got the man. Throughout the last several weeks, I listened to stories of unrequited love. Hoping, wishing and praying that the boy notices how much the girl likes them and begins what they hope is a romance to last the ages. Just a quick update, they haven’t gotten there yet. Many of us all to often wait for traumatic events to make life altering changes (i.e. World War II, September 11, Tsunami…) but even that is momentary. We may see a baby boom but long term inner strength is short fleeted. We all want love, yet too often we settle for security, a home, several children and an empty set of eyes to stare at each night. Girls grow up dreaming about the perfect Barbie life but somewhere along the line, they forget to go after it. What saddens me is that each day of waiting and living out this mental relationship fantasy is another day of life slipping away without the comfort of your dream bubble. Of course there is the risk. I know you are rolling your eyes saying “I am afraid to take the chance because if he doesn’t like me back I ruined everything” Isn’t being in love without the other one knowing and bringing mental anguish to yourself the ultimate tragedy? Each day you fight this war with yourself is another day to question yourself. How often do you ask yourself if you are attractive or good enough for him without realizing in the end it doesn’t matter? The beauty you seek and the reinforcement you need will never come from a boy. It is a self awareness and this will create a domino affect that will raise your confidence, your awareness, your happiness and ultimately that feeling of beauty will show in your glow and your actions. Stop waiting and hiding in your safety corner. If the feeling is there and the feeling is strong, follow your impulse.. You may be surprised with the end result. Previous Home is where the heart is…. That was great as usual Mark. 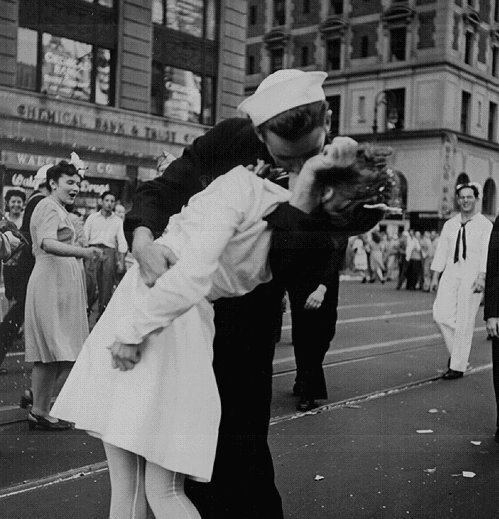 The world class picture of the world’s most famous kiss at the end of World War II right down to the most famous scene from 16 Candles. Very well put together, as usual!